A couple of our friends have been off their bikes over the past few months. Tori James our Patron has had Max, her first child and Alix Popham’s had a back injury. Conversations with them and Tom Walker have led us to post this Q and A which we hope you’ll find interesting. If you’ve any questions, please drop us a line and we’ll ask Tom to post a response, we can keep it confidential if you wish by not disclosing your name. 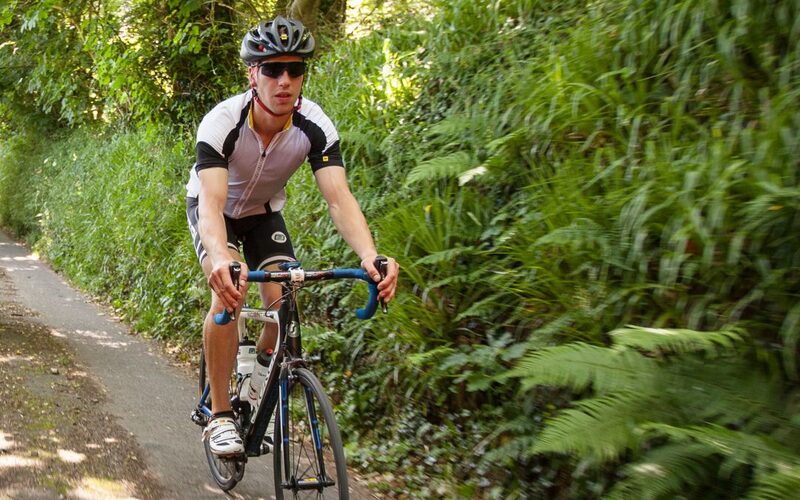 Rider: I’ve purchased the Tour of Pembrokeshire 50 mile route training plan but I’ve decided to ride The Paul Ties 100, how much extra should I add on to the long rides? TW: A good question and a tough one to answer without knowing further details. However, at this stage in the year I believe duration is more important than distance. If you’re doing the Paul Ties 100 mile route, look at your speed averages from similar rides last year and workout a predicted time. Say last year you did two century rides that took you between 8 – 8.30 hours on similar elevation profiles to the Tour, you can predict this year your fitness will improve and hopefully you can go under 8.00 hours. In which case, long rides should look to be between 5 – 7 hours. The remaining time can be seen to be taken care of through the other training sessions in the plan that build residual fatigue. So on harder weeks, the long ride can be 5 hours, thanks to the other sessions from the week still being in your legs. On the easier weeks the long ride can be 7 hours due to less fatigue being in your legs. Rider: I set my mind on doing the 75-mile route but still haven’t managed to go over 45 miles in one go. How do I train to ride longer and have I left it too late? TW: At this time (January 2018) no it’s not too late. I’d first ask, why? Why haven’t you managed to go over the 45-mile mark? Is it comfort on the bike issues? Not fuelling correctly (bonking)? Mentally can’t push on? Be interesting to know, and whatever the reason I’m sure I can help, so please get in touch. It may help to know that many a person has just turned up to the Tour with one long ride of 30 miles completed before and completed the longer routes! They just take their time and use the brilliant feed-stations to their advantage! On the flip side, many people have turned up underestimating the difficulty of the event and cut it short. You really are missing out on a fantastic day if you cut your ride short and it can be easily avoided. If you are concerned on achieving your entered distance please get in touch. Rider: What stretches do you recommend for cyclists? I get tired quads quickly and get a sore lower back after longer rides. TW: Tight quads and lower back pain is certainly common in cyclists. I really like the lying quad stretch and couch stretch for quad and hip flexors post ride to help ease the anterior muscles used when cycling. A wide leg standing straddle is great for stretching the posterior muscles used, particularly the medial hamstrings. Lower back pain is usually referred from other muscles causing tightness. I also recommend the pigeon stretch for the glute muscles which can also cause lower back pain. Stretch post ride for between 1-2 min on each stretch, use a passive approach and try to ensure your breathing is calm (8 – 10 sec inhale – 10 – 12 sec exhale). Foam rolling for myofascial release on tight muscles can also work; 30 – 60 sec on each muscle 3 – 4 times has been shown to work best. Of course, if the pain worsens or isn’t relieved through stretching then getting a bike fit is very worthwhile. Rider: I don’t use power or heart rate. Can I still follow the training plans? TW: Kind of, you can follow them along but it’s harder to judge if your fitness is improving or not. 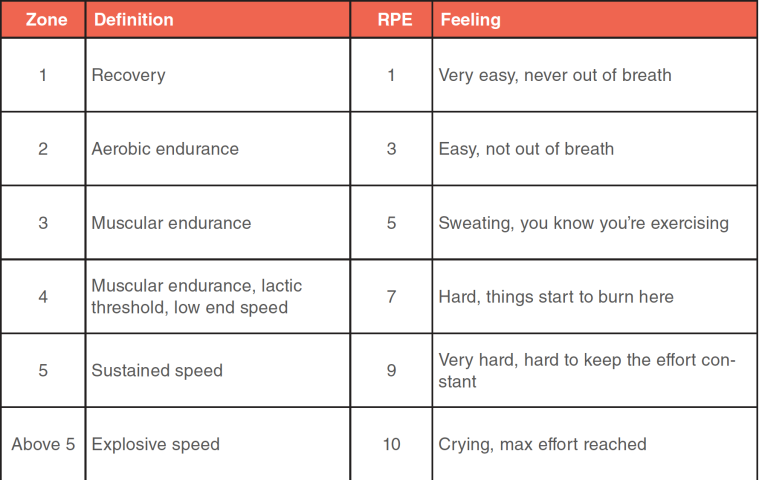 The chart below shows RPE (rating of perceived exertion) scale to the corresponding fitness zones which can help if you’re completing the program without physiological feedback.